Britain’s geographical isolation is one of the cornerstones of its identity which, combined with nationalist fervor, probably played at least some role in the country’s recent decision to depart from the European Union. But when the Isles first split from the rest of Europe hundreds of thousands years ago, things were considerably more violent. British researchers have already theorized that the UK was once connected to France via a land bridge, and then severed by erosive forces. But new research has revealed clues that a series of geological events probably caused the first break. And this research is important not only to understand how humans and animals populated the land mass during prehistoric times, but to understand the British Isles’ relevance today. 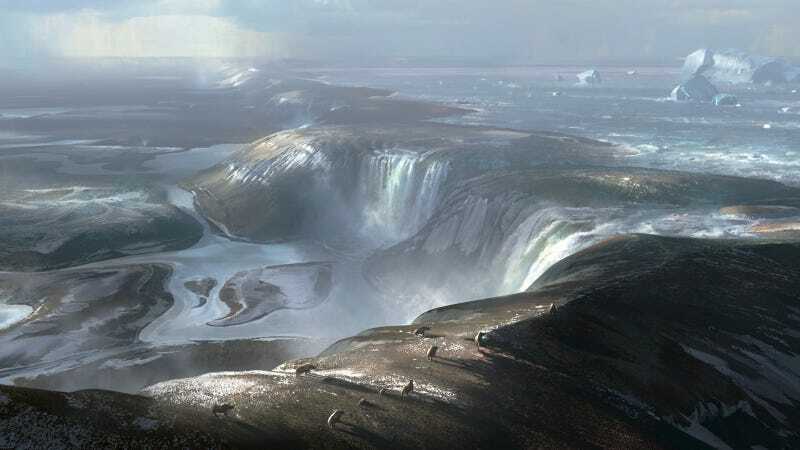 The researchers found lots of hints for an initial erosion event around 450,000 years ago, breaching the straits and pouring water into the English Channel. New sonar data of the region combined with seismic data of the crust beneath the water revealed deep depressions in the ground that would have turned up as the result of water falling over an escarpment. These long pools, some over a hundred meters deep, seemed to travel backwards matching a retreating cliff. But other sets of seemingly unrelated depressions showed the researchers that this chalk land bridge would have required a second large event to form the Straits of Dover. “It could have been a combination of factors that make the whole thing fail,” said Collier. This Brexit was’t a quick sever, but a maybe combination of several flooding events or possibly even earthquakes leading up to the final breach, which the researchers speculate happened around 160,000 years ago. Of course, this is all just the interpretation of the data, and there has been plenty of debate surrounding the formation of the channel. Other scientists believe a slow erosion formed the English Channel, or that it was a combination of processes. Mellett thought what scientists really need is more data. “We need to go and take samples, to drill the material on the seabed and see what we find to get ages and the exact timing of when these events happened. But all-in-all, Mellett was impressed by the dataset. Understanding Britain’s separation is a big deal to researchers hoping to shed light on a process so important to the British psyche today. And Collier ultimately acknowledges the paper’s awkward relevance, given Brexit’s top spot in the headlines these days.